Figure 1. Laundry Costs. An efficient washing machine operates at a low cost. In a market-oriented economy with a democratic government, the choice of what combination of goods and services to produce, and thus where to operate along the production possibilities curve, will involve a mixture of decisions by individuals, firms, and government, expressing supplies and demands. However, economics can point out that some choices are unambiguously better than others. This observation is based on the idea of efficiency. In everyday parlance, efficiency refers to lack of waste. 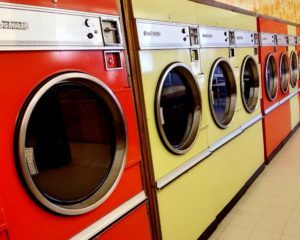 An inefficient washing machine operates at high cost, while an efficient washing machine operates at lower cost, because it’s not wasting water or energy. An inefficient organization operates with long delays and high costs, while an efficient organization is focused, meets deadlines, and performs within budget. The production possibilities frontier can illustrate two kinds of efficiency: productive efficiency and allocative efficiency. Figure 2, below, illustrates these ideas using a production possibilities frontier between health care and education. Figure 2. Productive and Allocative Efficiency. Points along the PPF display productive efficiency while those point R does not. Productive efficiency means that, given the available inputs and technology, it’s impossible to produce more of one good without decreasing the quantity of another good that’s produced. All choices along the PPF in Figure 2, such as points A, B, C, D, and F, display productive efficiency. As a firm moves from any one of these choices to any other, either health care increases and education decreases or vice versa. This makes sense if you remember the definition of the PPF as showing the maximum amounts of goods a society can produce, given the resources it has. Thus, producing efficiently leads to maximum production, which is what the PPF shows. However, any choice inside the production possibilities frontier is productively inefficient and wasteful because it’s possible to produce more of one good, the other good, or some combination of both goods. Wasting scarce resources means the society is not producing as well or as much as it could, so it is not operating on the PPF. For example, point R is productively inefficient because it is possible at choice C to have more of both goods: education on the horizontal axis is higher at point C than point R (E2 is greater than E1), and health care on the vertical axis is also higher at point C than point R (H2 is greater than H1). Any time a society is producing a combination of goods that falls along the PPF, it is achieving productive efficiency. When the combination of goods produced falls inside the PPF, then the society is productively inefficient. Allocative efficiency means that the particular mix of goods a society produces represents the combination that society most desires. For example, often a society with a younger population has a preference for production of education, over production of health care. If the society is producing the quantity or level of education that the society demands, then the society is achieving allocative efficiency. Determining “what a society desires” can be a controversial question and is often discussed in political science, sociology, and philosophy classes, as well as in economics. At the most basic level, allocative efficiency means that producers supply the quantity of each product that consumers demand. Only one of the productively efficient choices will be the allocative efficient choice for society as a whole. For example, in order to achieve allocative efficiency, a society with a young population will invest more in education. As the population ages, the society will shift resources toward health care because the older population requires more health care than education. In the graph (Figure 2) above, a society with a younger population might achieve allocative efficiency at point D, while a society with an older population that required more health care might achieve allocative efficiency at point B. We will return to this idea of allocative efficiency later when we learn more about applications of supply and demand. Every economy faces two situations in which it may be able to expand the consumption of all goods. In the first case, a society may discover that it has been using its resources inefficiently, in which case by improving efficiency and producing on the production possibilities frontier, it can have more of all goods (or at least more of some and less of none). In the second case, as resources grow over a period of years (e.g., more labor and more capital), the economy grows. As it does, the production possibilities frontier for a society will tend to shift outward, and society will be able to afford more of all goods. However, improvements in productive efficiency take time to discover and implement, and economic growth happens only gradually. So, a society must choose between trade-offs in the present—as opposed to years down the road. For government, this process often involves trying to identify where additional spending could do the most good and where reductions in spending would do the least harm. At the individual and firm level, the market economy coordinates a process in which firms seek to produce goods and services in the quantity, quality, and price that people want. But for both the government and the market economy, in the short term, increases in production of one good typically mean offsetting decreases somewhere else in the economy. While every society must choose how much of each good it should produce, it doesn’t need to produce every single good it consumes. Often, how much of a good a country decides to produce depends on how expensive it is to produce it versus buying it from a different country. As we saw earlier, the curve of a country’s PPF gives us information about the trade-off between devoting resources to producing one good versus another. In particular, its slope gives the opportunity cost of producing one more unit of the good in the x-axis in terms of the other good (in the y-axis). Countries tend to have different opportunity costs of producing a specific good, either because of different climates, geography, technology, or skills. 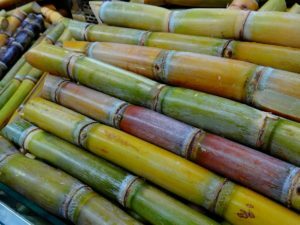 Suppose two countries, the U.S. and Brazil, need to decide how much they will produce of two crops: sugar cane and wheat. Due to its climate, Brazil can produce a lot of sugar cane per acre but not much wheat. Conversely, the U.S. can produce a lot of wheat per acre, but not much sugar cane. Clearly, Brazil has a lower opportunity cost of producing sugar cane (in terms of wheat) than the U.S. The reverse is also true; the U.S. has a lower opportunity cost of producing wheat than Brazil. This can be illustrated by the PPF of each country, shown in Figure 4, below. Figure 4. Brazil and U.S. production possibility frontiers. When a country can produce a good at a lower opportunity cost than another country, we say that this country has a comparative advantage in that good. In our example, Brazil has a comparative advantage in sugar cane, and the U.S. has a comparative advantage in wheat. One can easily see this with a simple observation of the extreme production points in the PPFs. If Brazil devoted all of its resources to producing wheat, it would be producing at point A. If, however, it devoted all of its resources to producing sugar cane instead, it would be producing a much larger amount, at point B. By moving from point A to point B, Brazil would give up a relatively small quantity in wheat production to obtain a large production in sugar cane. The opposite is true for the U.S. If the U.S. moved from point A to B and produced only sugar cane, this would result in a large opportunity cost in terms of foregone wheat production. The slope of the PPF gives the opportunity cost of producing an additional unit of wheat. While the slope is not constant throughout the PPFs, it is quite apparent that the PPF in Brazil is much steeper than in the U.S., and therefore the opportunity cost of wheat is generally higher in Brazil. In the module on international trade you will learn that countries’ differences in comparative advantage determine which goods they will choose to produce and trade. When countries engage in trade, they specialize in the production of the goods in which they have comparative advantage and trade part of that production for goods in which they don’t have comparative advantage in. With trade, goods are produced where the opportunity cost is lowest, so total production increases, benefiting both trading parties.